How do I Find a Local Divorce Attorney near me in Orange County? Local Divorce Attorney in Orange County? "I need a good Divorce attorney near me" is what many people think about when contemplating a legal separation or dissolution of marriage. Going through a divorce is never easy or simple. It doesn't, however, have to be overly complicated. It's important to discuss your case with a qualified attorney. Many people hesitate to seek out proper legal representation because they don't want to come off as aggressive, but an attorney can help you understand your case and your rights. Now, you're probably wondering, "how do I find a local divorce attorney near me in Orange County?" Once you understand the divorce process, you can find a qualified lawyer in your particular area. What does a divorce or separation entail? Divorce has evolved a lot over the past few decades. 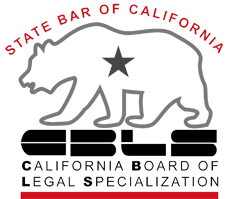 No-fault divorces are widely accepted throughout most states including California. This means you can cite general "irreconcilable differences" as a valid reason for divorce instead of drastic circumstances such as adultery or domestic violence. Still, divorce is never simple – even if you and your partner communicate well. In fact, it can be down-right intimidating if you aren't family with the court process and legal paperwork. Before navigating through your divorce, it's important to understand your options. During your marriage, everything you acquired is considered shared property. When you decide to split, you'll need to decide how to split up that property. On paper, this sounds pretty simple, but if you and your spouse don't agree on things, the process can quickly become complicated. Unfortunately, the lines between shared and separate property aren't as clear-cut as they may seem. This is especially true when you consider that during marriage, the lines blur between whose is whose. During a divorce or separation, you'll also need to decide child custody, child support, and spousal support. The courts will also take any prenuptial agreements into consideration when a final decision is made. Which divorce process is right for me? Your divorce process is ultimately dictated by certain factors in your particular case. In general, you want the simplest, fastest, cheapest, and least complicated route possible. No divorce is fast – divorces in California take at least six months to finalize -- but certain things can help the process move faster. Do you and your spouse communicate well or are you willing to negotiate in a civil manner? Did you accumulate large sums of assets during the marriage? Is one spouse reliant on the other for financial support? Not every divorce involves a dramatic court battle. In fact, you have several options at your disposal. If you and your spouse don't disagree on anything or your spouse doesn't respond to divorce paperwork, you could qualify for an uncontested divorce. You simply go your separate ways without any dispute. Even if you and your spouse don't agree on everything, you still may not need to enter a court room. Thanks to alternative dispute resolution, you can work out your differences in a more private, less intense setting. Arbitration: During this type of divorce, a third party known as an arbitrator looks over your case and makes a final agreement. Mediation: A mediator will join you and your spouse to help facilitate conversation. Unlike arbitration, the mediator will not make any final decisions. Collaborative divorce is similar to the other forms of alternative dispute resolution in that it takes place outside a court room. During this type of divorce, however, attorneys will join you to help negotiate the terms of your divorce. Summary divorces are probably the fastest and simplest types of divorce. In order to qualify, you must have only been married for a short amount of time. If you and your partner can't work out your disagreements through alternative dispute resolution, you may find yourself facing a contested divorce. It doesn't mean that you and your spouse disagree on everything – you may only disagree on one small part of the divorce such as the custody arrangement or child support. If you think you're heading for a contested divorce, it's important to find a local divorce attorney in Orange County to discuss your case and protect your rights. How do I find a local divorce lawyer near me in Orange County? In order to find the best divorce attorney for your case, you need to understand your goals and expectations for the divorce. Stay local: Local attorneys will know all the city laws and regulations. Plus, you'll want someone available nearby in case an emergency pops up. Do your research: Check local lawyers on LinkedIn or ask friends who have gone through a divorce themselves. They could tell you which attorneys are great and which ones to stay away from. Don't jump the gun: Select three attorneys and conduct some interviews before making a decision. Most law offices offer free consultations to discuss your case and goals. Having proper legal representation can protect your rights, provide education about your case, and help file proper paperwork. 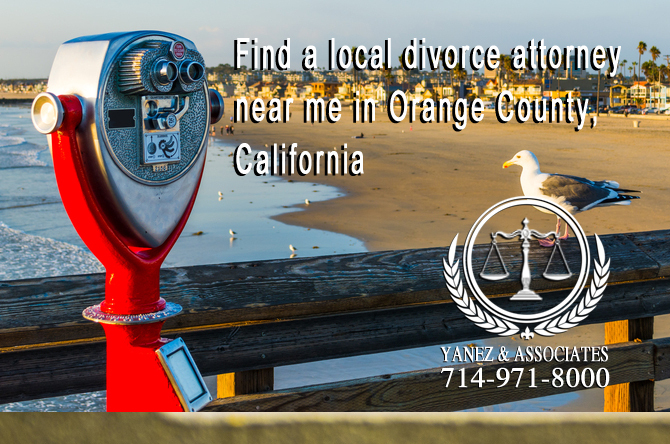 If you're looking for a divorce attorney in Orange County, California, contact Yanez & Associates Divorce & Family Law Attorneys today at 714-971-8000 for a free consultation. We're available 24/7. 1 Local Divorce Attorney in Orange County? 2 What does a divorce or separation entail? 3 Which divorce process is right for me? 4 How do I find a local divorce lawyer near me in Orange County? A local divorce attorney near me in Orange County California, How do I find a local divorce lawyer near me in Orange County?, Local Divorce Attorney in Orange County?, What does a divorce or separation entail?, Which divorce process is right for me?